So...you think your child is gay? YouGov polling shows that 81 per cent of people in Britain would be comfortable if their child grew up to be lesbian, gay or bisexual. But that doesn't mean that these parents don't have understandable questions or concerns when they think that their child might be gay. Just as coming out can be difficult for young people even the most well-meaning parents find themselves worrying, particularly about whether they're doing and saying the right thing. 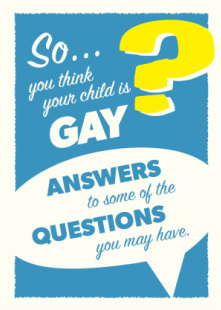 The fabulous folk at Stonewall have designed a guide to give answers to some of those common questions that parents might have when they think their child is gay, or has just come out. Written with a straight forward way, it dispels the common myths about what being gay means for young people, as well as helping parents to create a supportive environment for their children. What if I don't like their partner? How do I know they're gay? Will I still be able to have grandchildren?